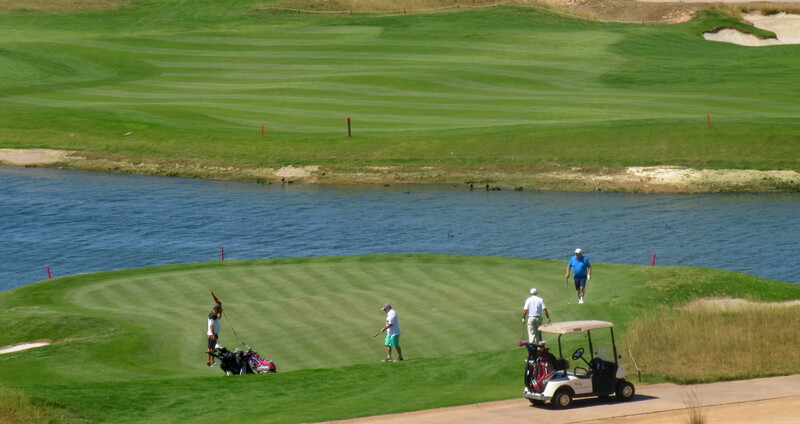 This week saw the popular texas scramble format played with 15 teams. 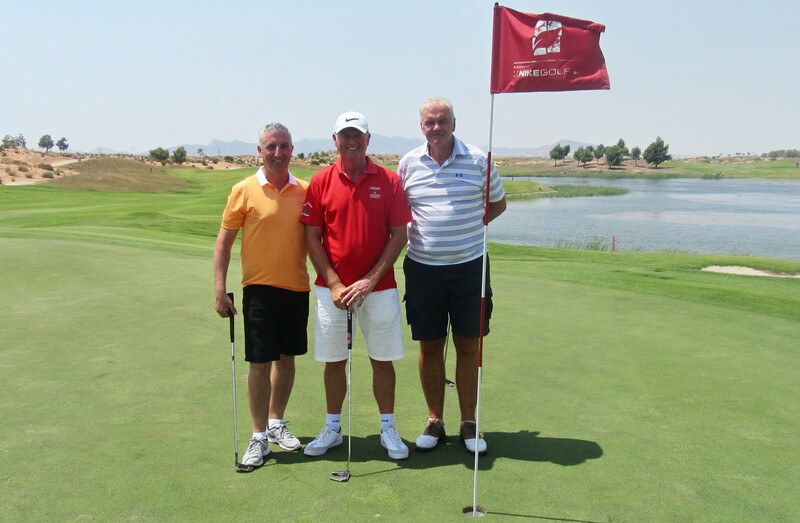 As usual there were some great scores (the first 3 teams all posted 63’s – 9 under par). 14 of the teams were under par gross, and it showed that this format is won by good putting – just pars are not good enough! Thanks to Anthony McNally who volunteered to be starter this week – we still need cover for next few weeks. the same gross, but a greater handicap allowance for the winners……………. 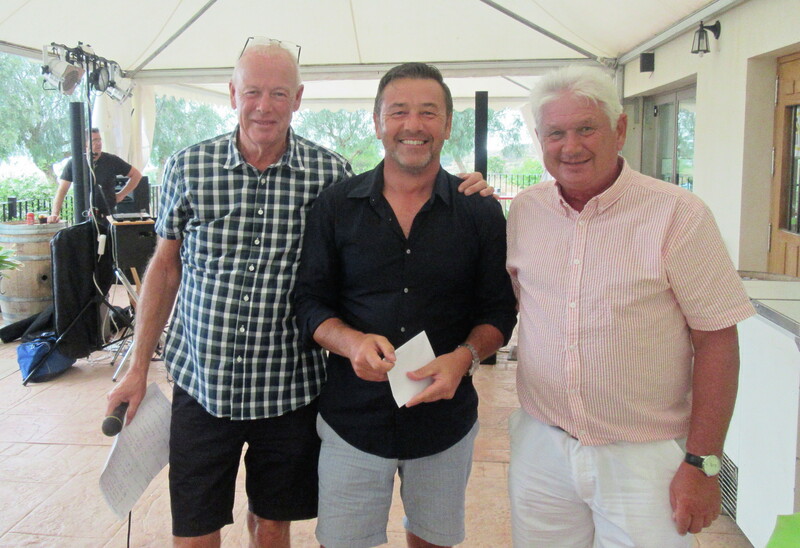 My team of Owen Moore, Tim Rowley and Tom McFarlane had 14 pars and 4 birdies (one here at the last), but that was only good enough to finish close to the bottom of the pile……………. 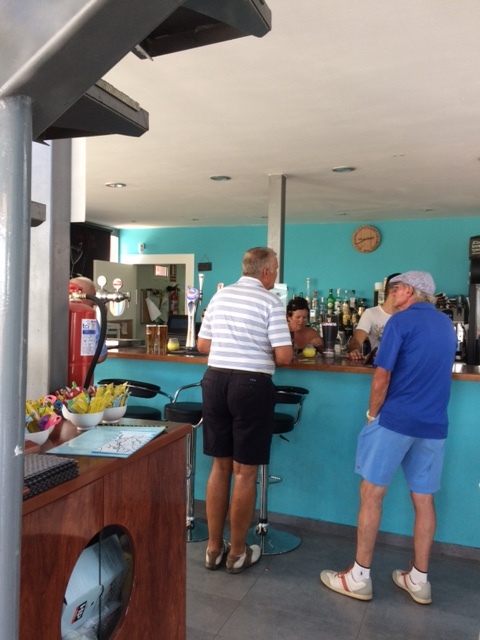 Next week is the August Apollo Air individual stableford. Unfortunately, I have had some very sad news this week. 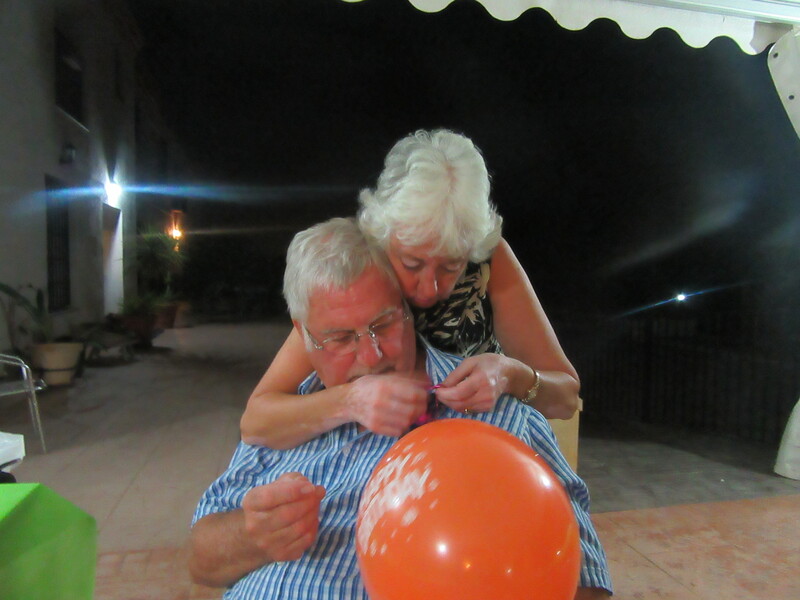 One of our members, Paul Coopey, passed away after months of bravely battling cancer. 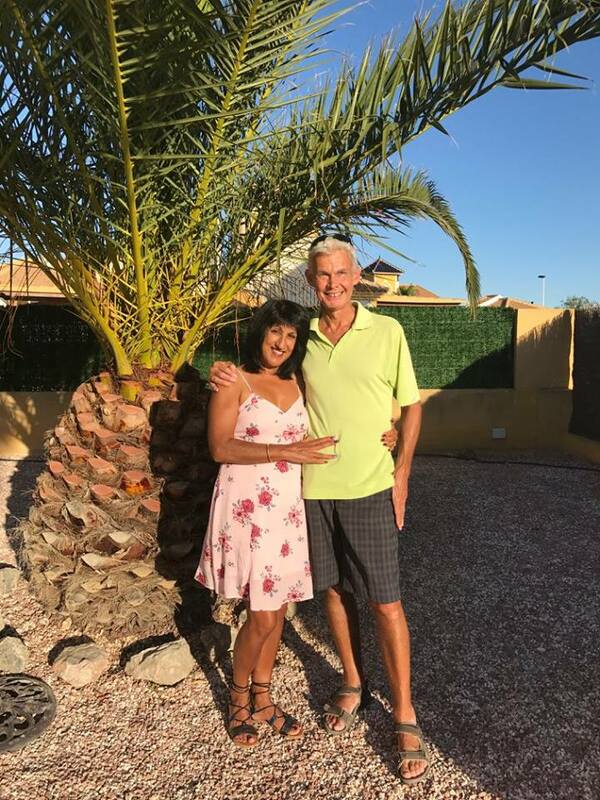 Our heartfelt sympathy goes to Paul’s partner Kam and his family and friends. 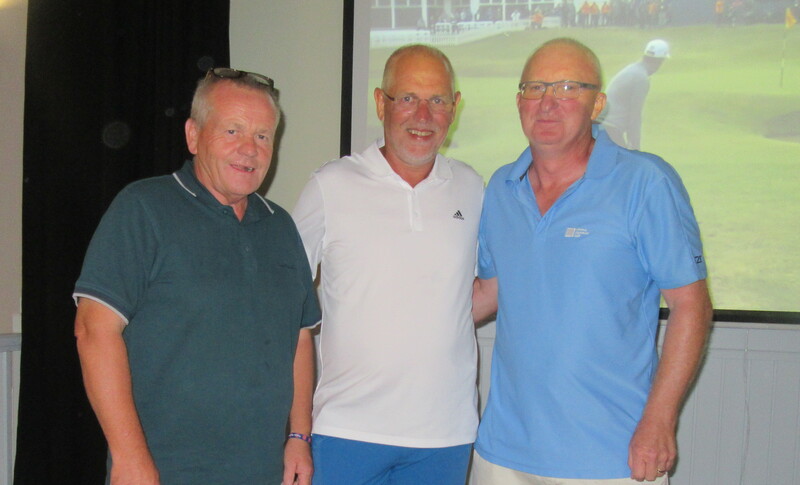 When the committee were made aware of Paul’s situation we decided to make Cancer UK the charity which will benefit from fund raising on our Seve Trophy day on August 11th. 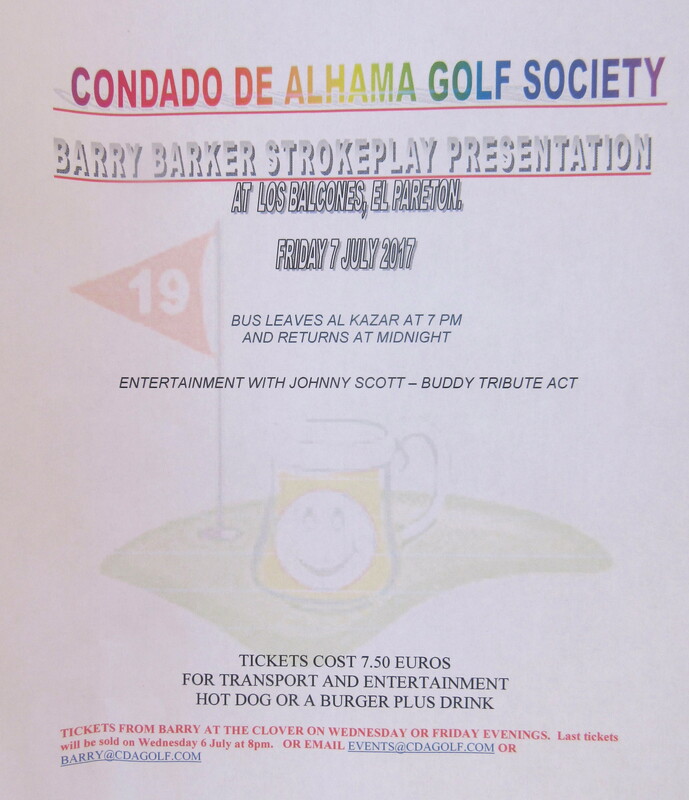 Please support the event and contribute in any way that you can by playing, buying tickets, sponsoring holes/spot prizes, or donating to the raffle. Excellent conditions for the 58 players, although very warm for the later starters. With soft greens and little or no wind, the better golfers took advantage to return some great scores. 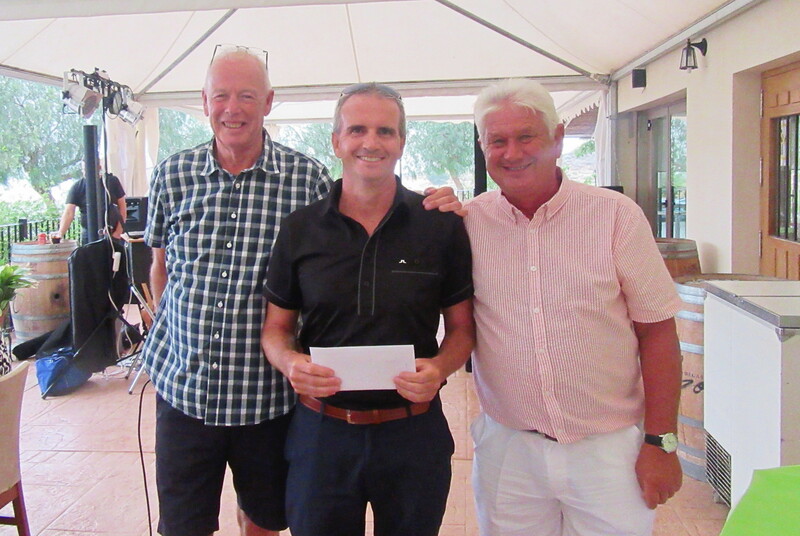 Paul Harrington burnt the course up with his gross score of 71 (one under par), but his 42 points still wasn’t good enough to win the 1st division prize. Thanks to Alex and Seb Cave for covering the starter’s duties, but we still need volunteers for the coming weeks. 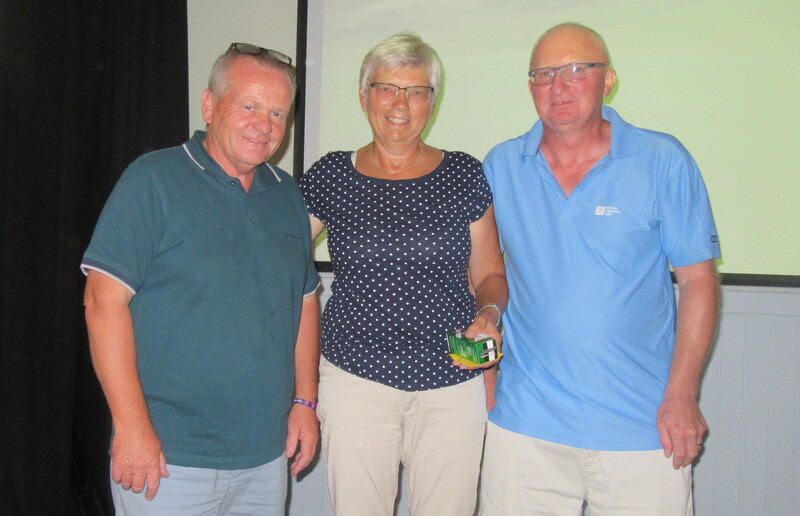 a fine score from Gro won her the ladies prize…………. 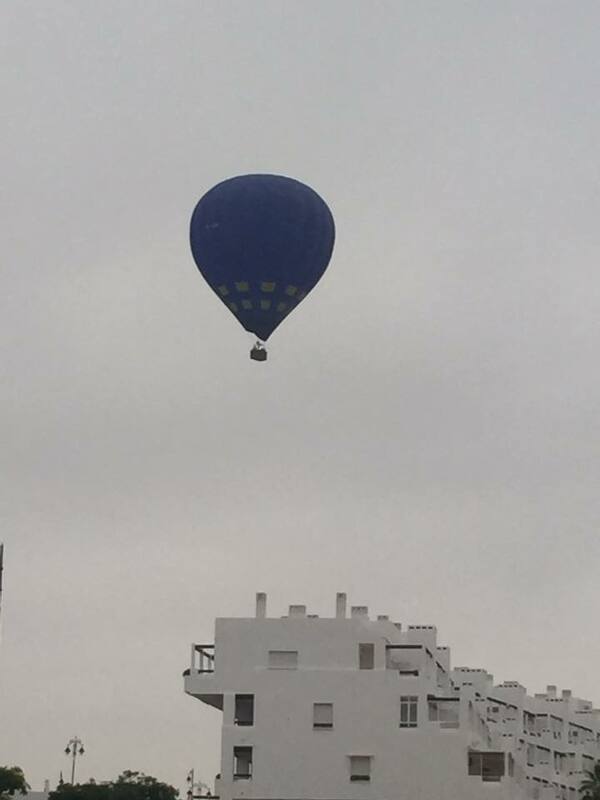 Notice that Kevin Smith was on the stage again – no prize this week, but handing them out……………..
We had the hot air balloon overhead again at 08.30 – an early start for the helium junkie……………. Gert Willumsen was very visible from the air – maybe even from a 737……………. Next week is a 4 person texas scramble. A neighbour was bitten by a rabid dog. I went to see how he was and found him writing frantically. I told him rabies could be cured and he didn’t need to write a will. He said, ‘Will? What will? I’m writing a list of people I want to bite’. 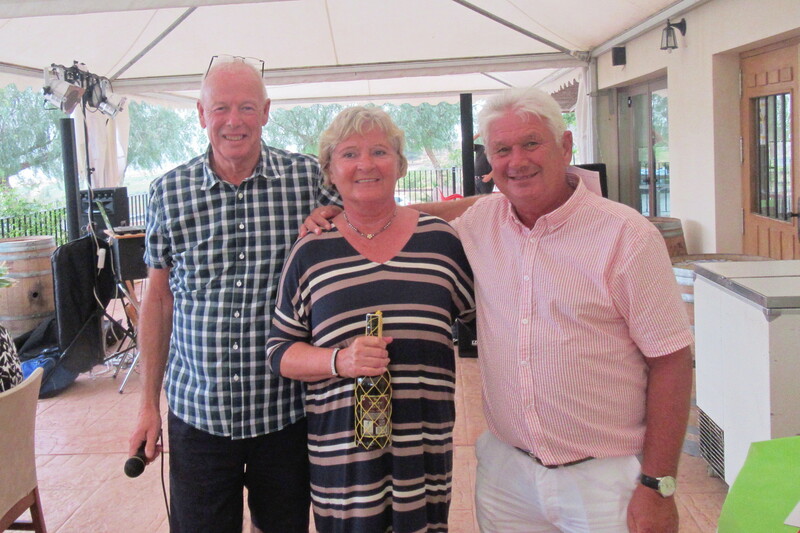 Neil & Lynn return from their ‘around the world’ tour…………. Not just an important monthly trophy but also contributing to the annual Apollo Air champion. Now we have 6 results in (for some), it means a good score will increase your 6 score total – your worst score drops off if you beat it! Kevin Smith and Chris King are leading with 6 very respectable scores, but that means it is difficult for them to improve (nothing is taken off your total each month, you just replace your worst score if you get a better one). All those in contention have a chance to close the gap. Check the ‘best of series’ leaderboard on masterscoreboard (link – best of series) to see who has 6 rounds in and has a chance (still 5 more comps for things to change). Without 6 qualifying scores before the end of the year it will be difficult to challenge. A few more to get their 6th round in, so it is likely to bunch up. 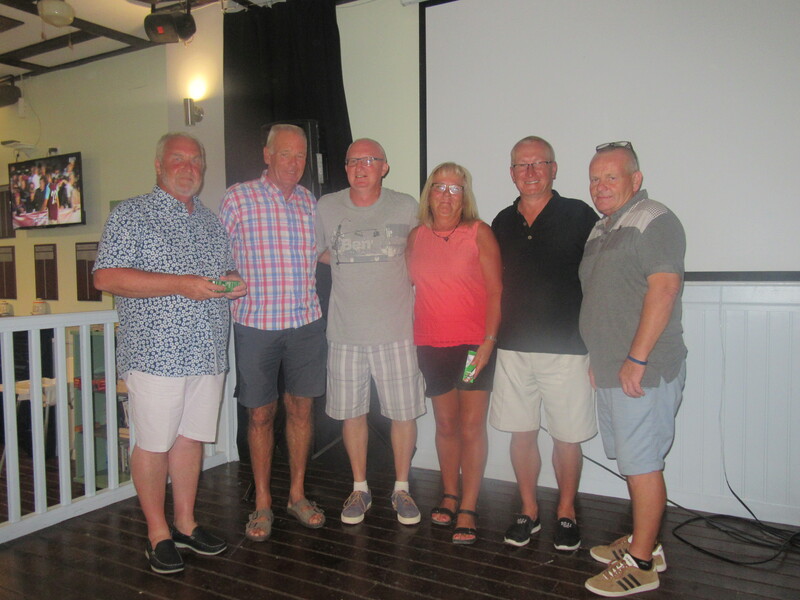 Just a reminder to everyone the presentation is at 7pm prompt in the Clover, it is disappointing when some of the winners are not there………………. 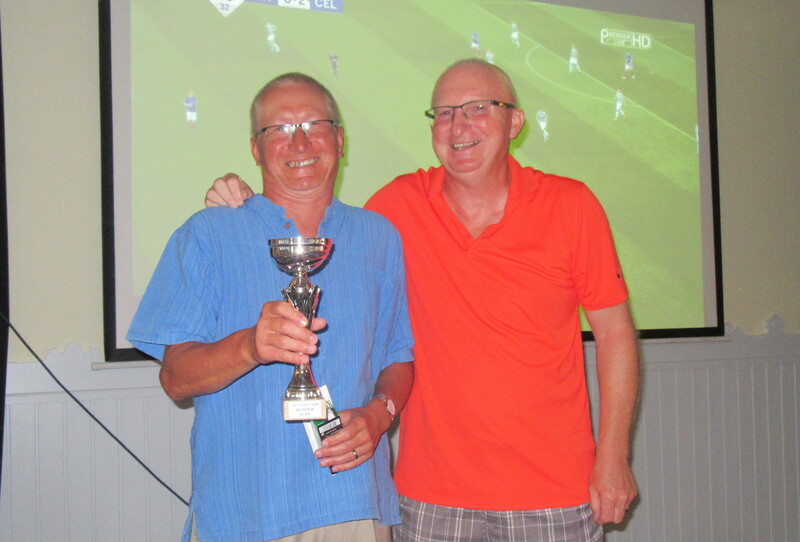 Bob was the champion for July……………………. 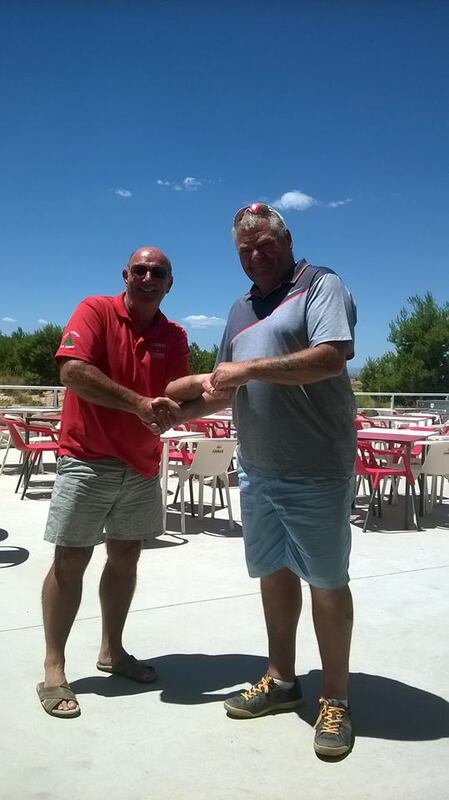 Kevin wins division two again………………..
Nick won the 1st division…………. 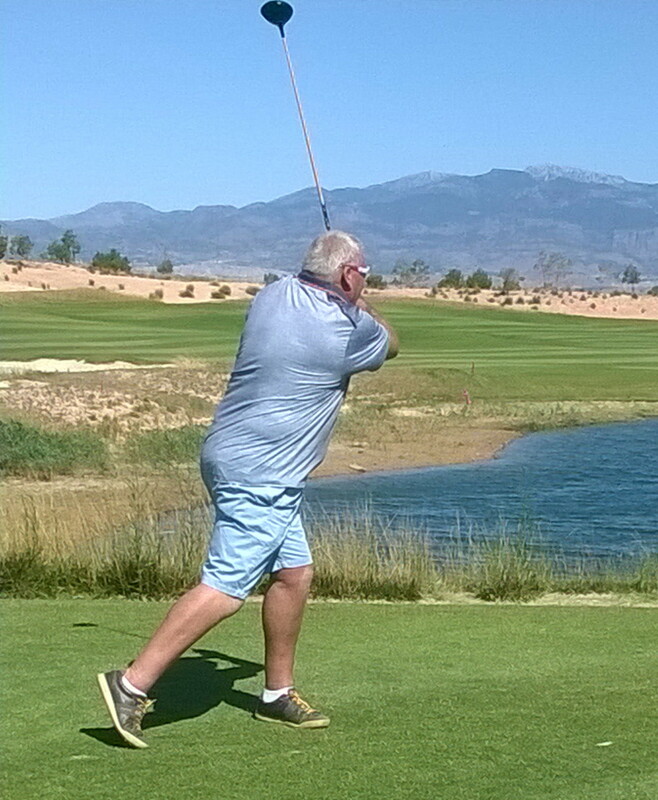 a view of the 2nd green as Jim Laird tries for his birdie………………. can Kev be tempted by the flag with the hazard waiting for him? 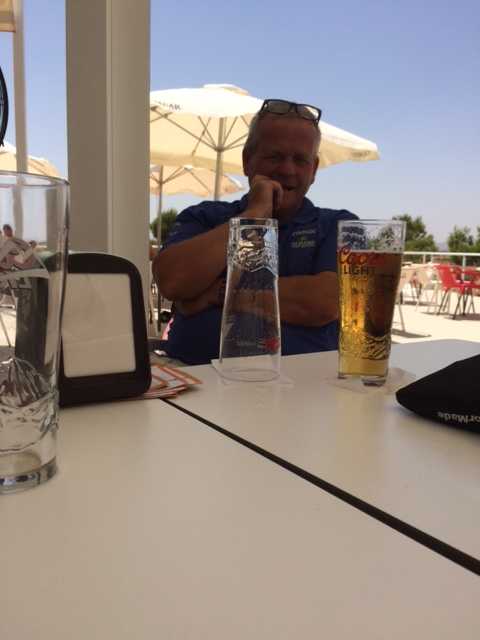 and this was the entertainment in the bar – Kev has 3 hornets trapped in the glass (Don added a beetle). No creatures were harmed in this experiment, Jenny came and released them all into the wild….. 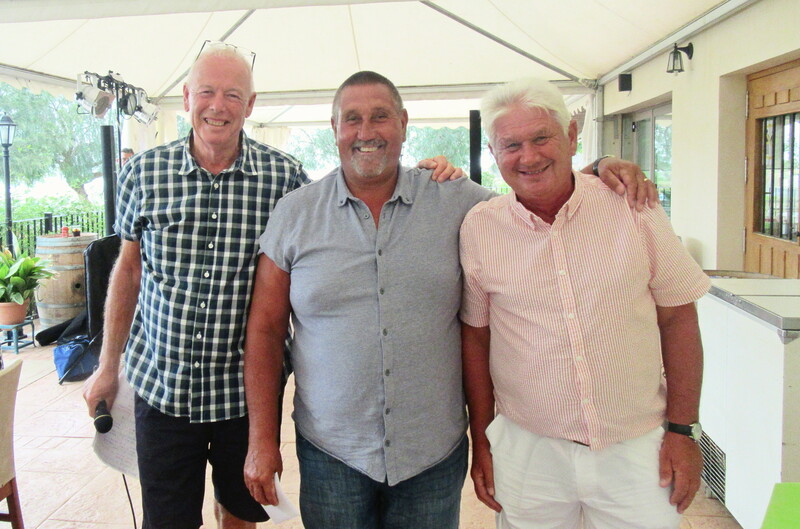 Spent an hour with Peter Reeves, and it was great to see him looking a little like his old self, although there is less of him – he has lost 14 kilos, but probably at his ideal weight now. Just doing a little walking to get his hip going, and a siesta or two, but maybe he will be back on the course by September. Next week is an individual stableford. ‘We can’t because we have no teeth’ she replied. ‘We just love the chocolate around them’. 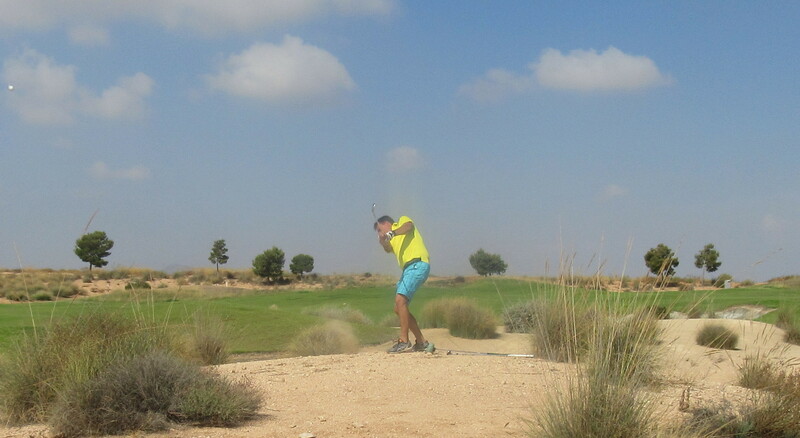 Recently we have reports from members that after playing in competition, they checked their actual handicap with the slope index as displayed in the Pro shop at Condado de Alahama and found that they should have played with an extra shot. The committee have now discovered that GNK have made minor changes to the course and slope ratings without informing us. To date this has only affected a very small number of members. The Committee have now amended these values in the Handicap Master system and we believe that the changes will not make a significant difference to the members handicap’s and the majority may not notice any change. However, we may have to amend our conversion table by which we convert Congu handicaps to EGA and subsequently readjust all members handicaps who have a Congu handicap. Again, we believe that any changes to members handicap’s will be minimal if any. As we already have over 450 members registered for the current year it will take some time to check all the handicaps, so we ask that bear with us until we have fully completed the correction. The correct slope index with shots received is posted on the society noticeboard. 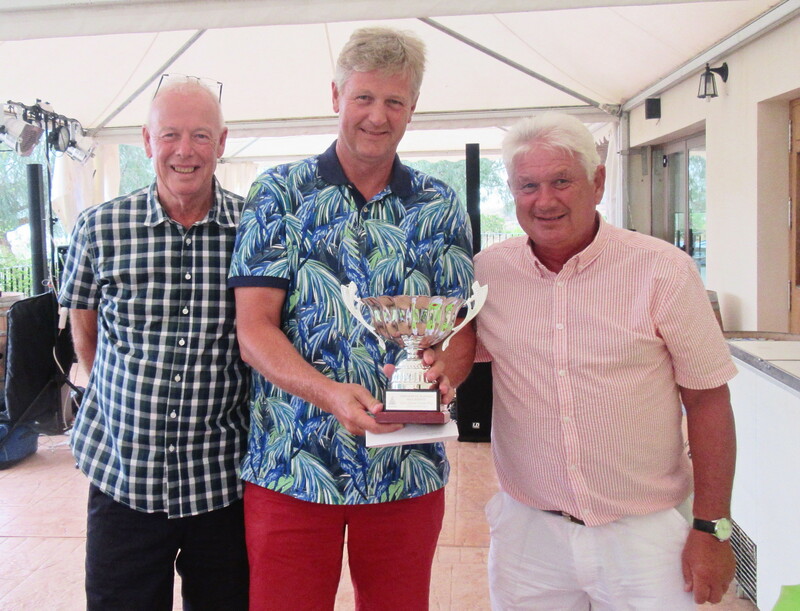 Lasse was the winner in probably the hardest format………………..
46 players for the annual strokeplay championship, and we played in all kinds of weather – rain, sun, wind, no wind, dark skies, blues skies………………………. 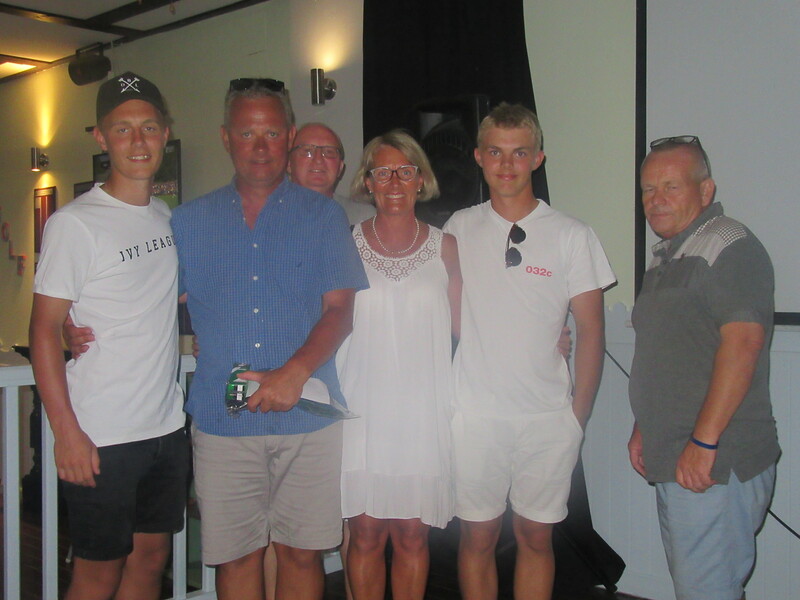 As usual there weren’t many who could avoid a card destroying hole but Lasse Johannesen managed it to take the trophy. Surprisingly there were only 2 no returns. 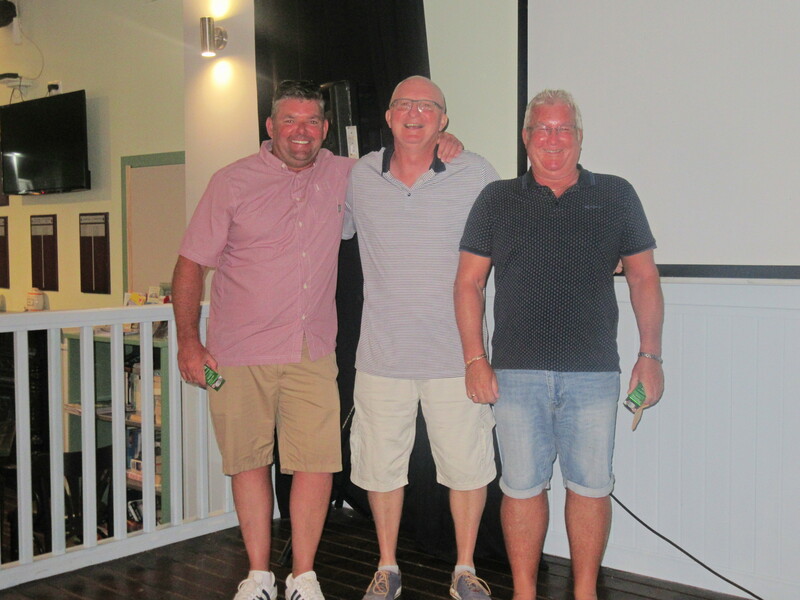 But there were a couple of excellent gross scores – 76 by Chris King and 77 from Chris McAllister. 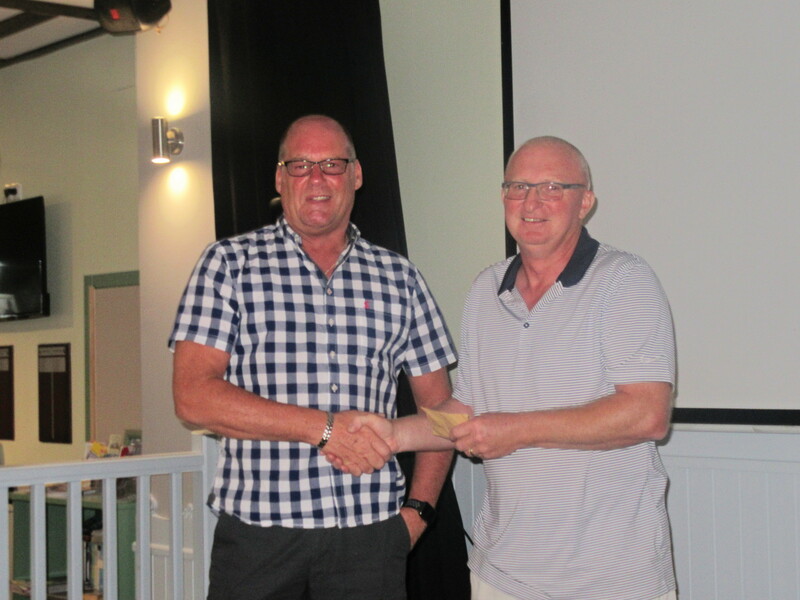 Thanks to Phil Cooke who has been putting in extra shifts while many of the committee are away, and to Alicia who organised the prizes and evening function. Ray Vivian acted as starter which was also greatly appreciated. 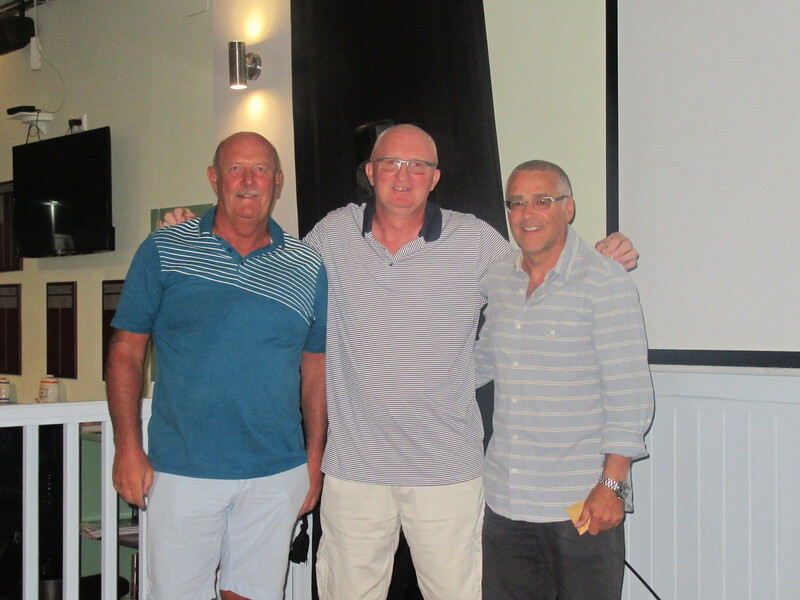 Chris continues his run of good form………..
Ray won the 2nd division…. 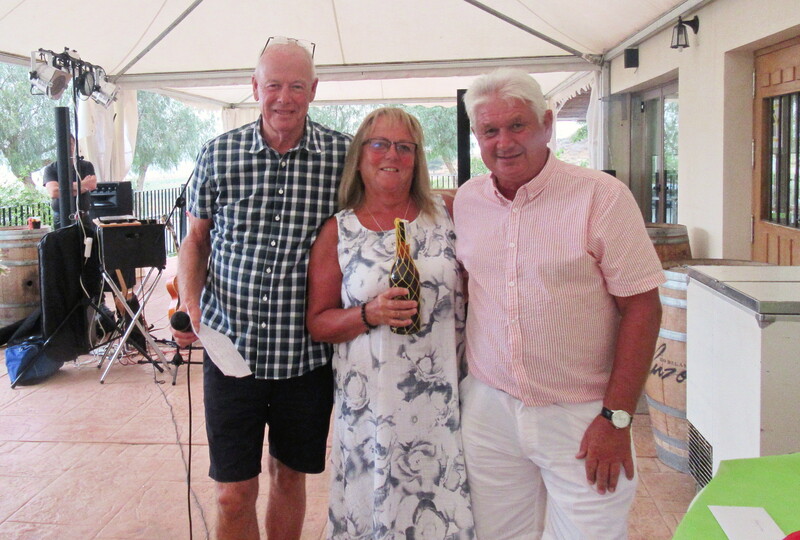 and Pat won the ladies……. 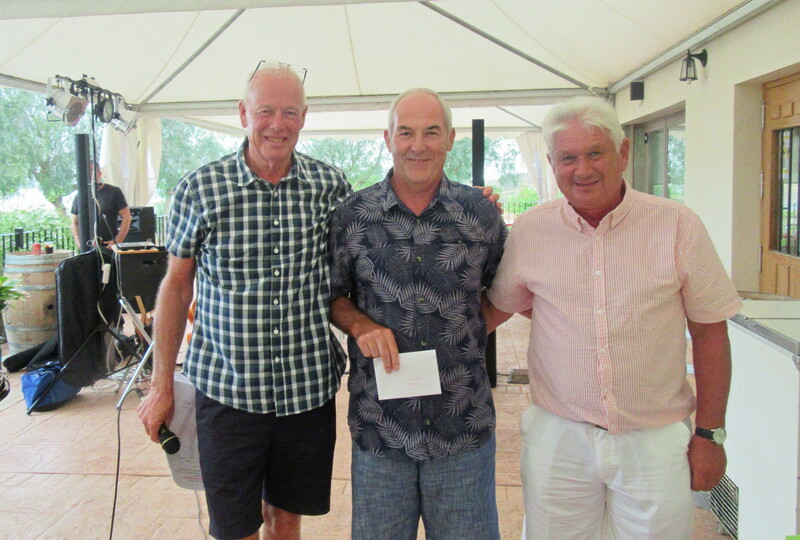 Gunnar was in the prizes………………..
Les Hurren had a good round………………. 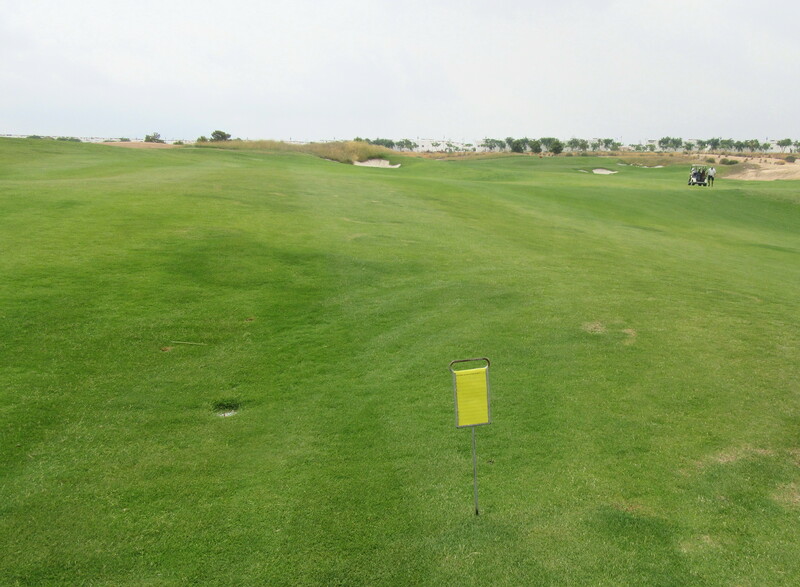 and Astri won two prizes……………..
Alicia was hoping her 2nd shot on 15 would be nearest the pin – this is where she finished. Nearest the sprinkler head maybe…………. 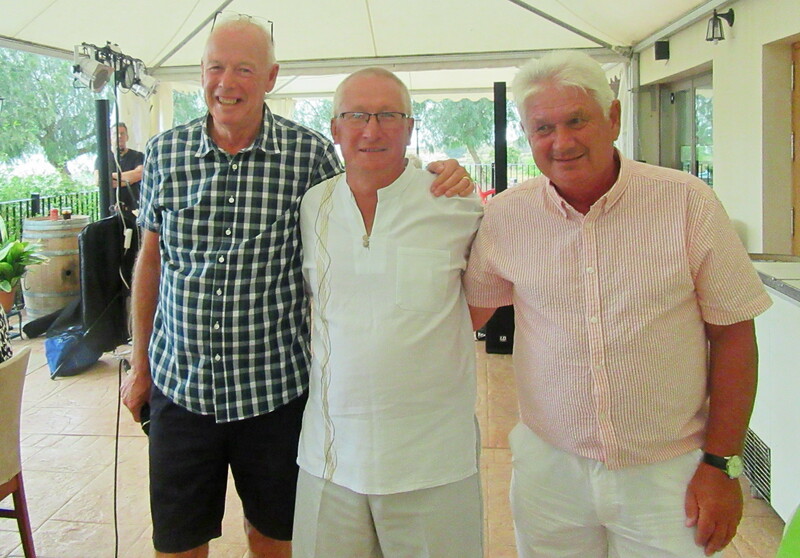 repair work on the greens has now reached the 4th – Chris chips toward the temporary…………..
A pity that not many went to the presentation at Los Balcones, but we had an excellent entertainer in Johnny Scott, who delivered lots of the classics from the 60’s and could play his guitar. We also celebrated Barry Answer’s 70th birthday at midnight. 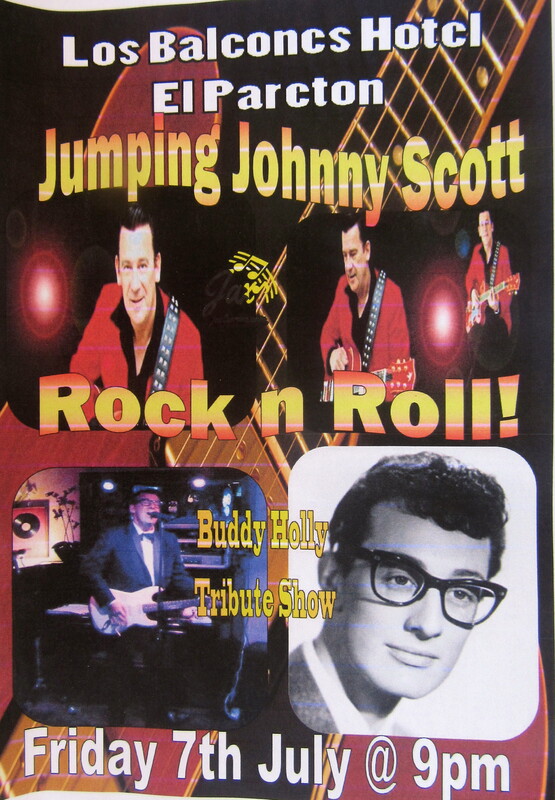 70 would have been a good score, but 3 score and 10 doesn’t win anything………. Next week is the Apollo Air individual stableford. Please be aware that competition entries close 24 hours before the comp (Monday and Friday comps) and 36 hours before comp (Friday comps) as we are obliged to submit our start sheets to the Pro shop at these times, thus releasing unused slots back for general bookings. There is an amount of flexibility on Mon and Wed, were a slot is available within Society times, but none for Friday competitions as we have to print cards etc. WIFE: “You would?” (with a hurtful look on her face). 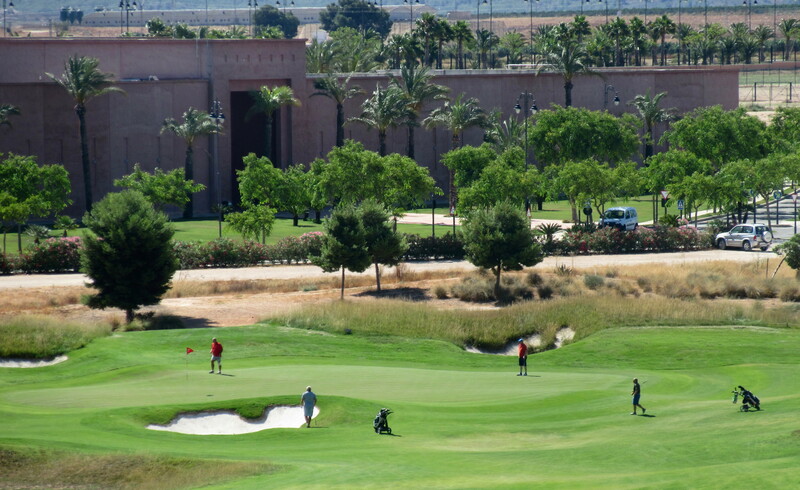 stripes on the 11th green and across the 10th fairway……….. 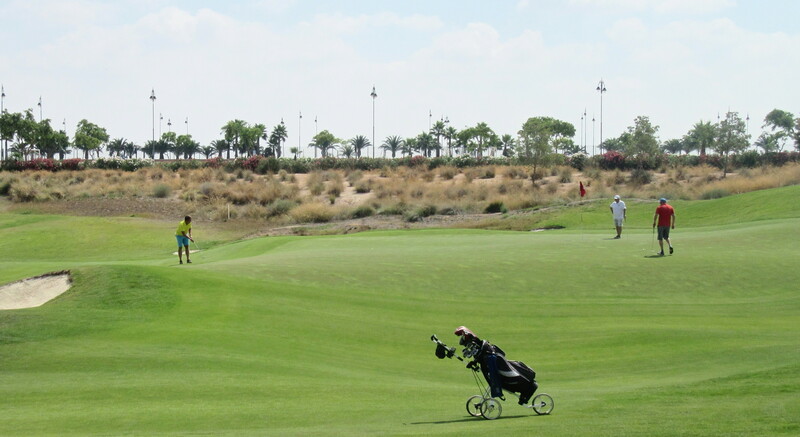 The course was in excellent condition for the 44 players, but a strong wind made scoring difficult. At the same time last year 46pts was only good enough for 3rd, but would have been a clear winner this week. 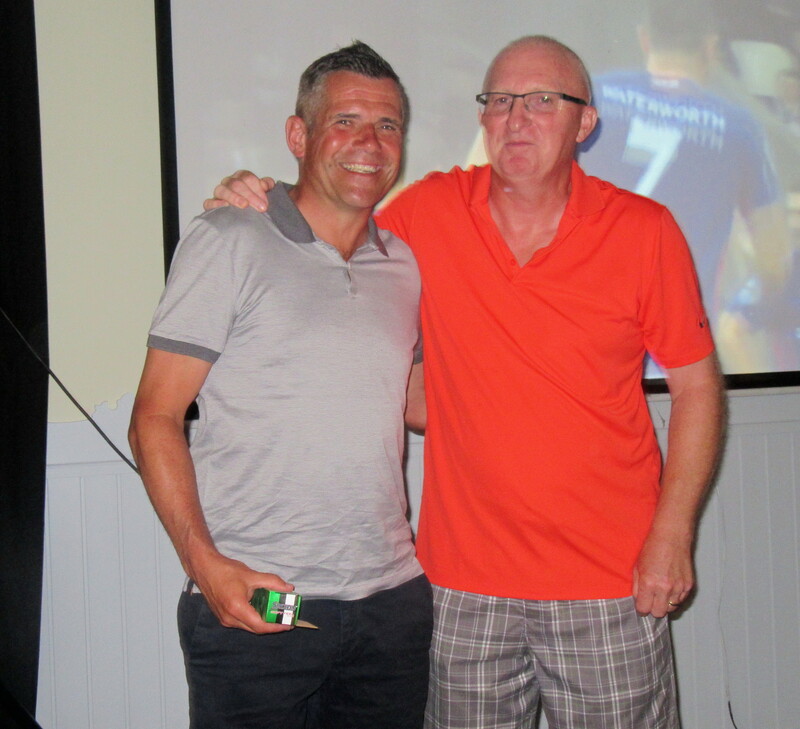 relegation for both their teams at football, but champions in their own right on Friday……..
Joe misjudged the presentation time (7pm!) 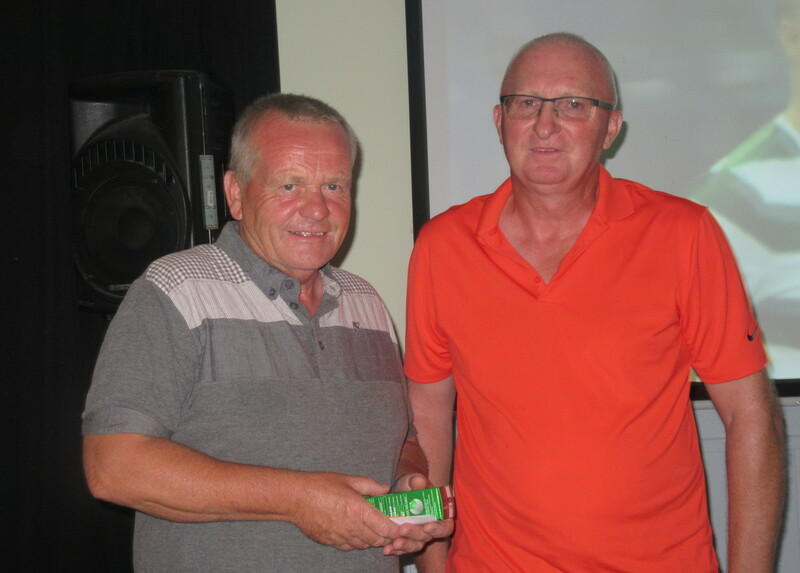 so Meurig collected their winnings………. very green at the moment…………….. 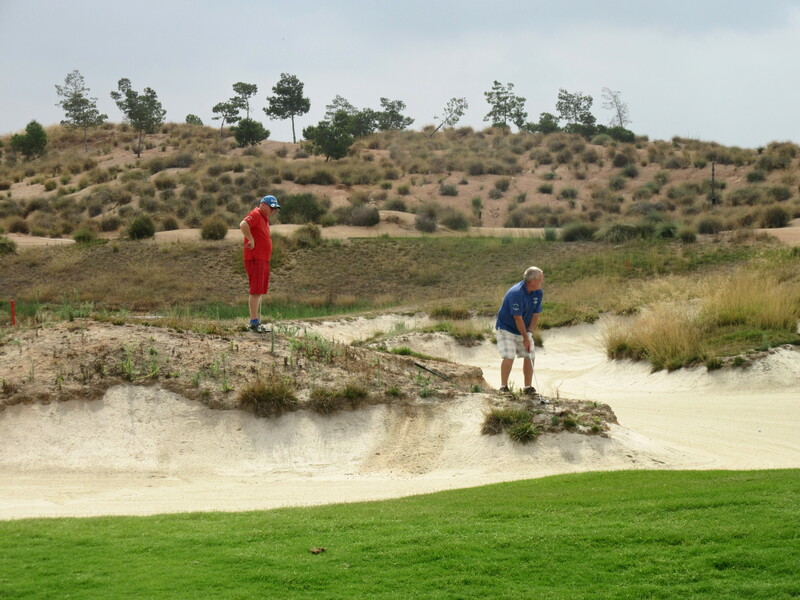 I mentioned how strong the wind was – Keith Miller is a single figure golfer, but needed to hit driver to carry the water on the par 3 11th (aprox 180 yds to pin). Great shot and he got his par! looks like he didn’t hold back!…………….. 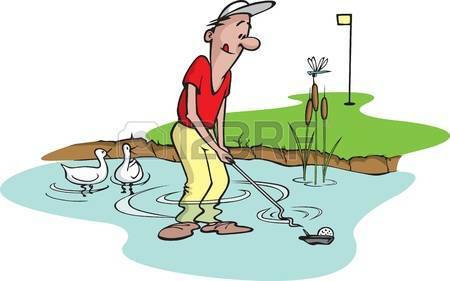 He also played a wonder shot on 18…………..2nd shot into the water, needing a 4, splashed it onto the green and holed the putt! 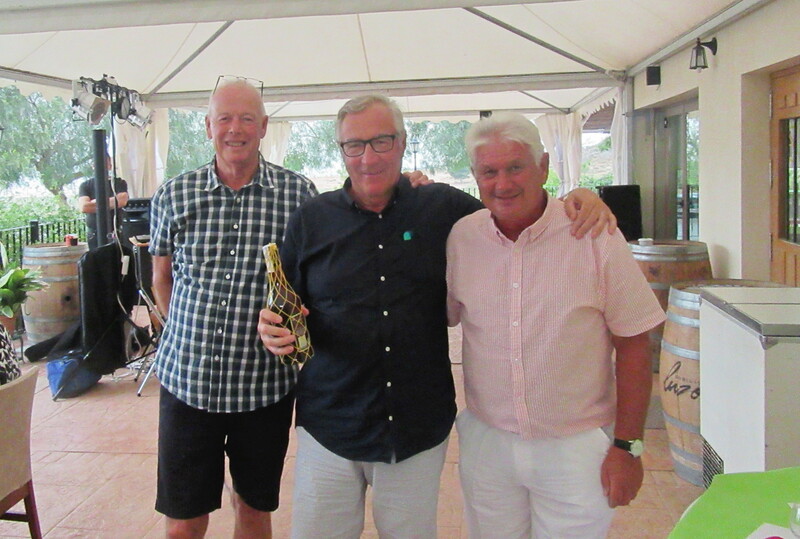 however, still one shot short of a half with Dave…….paying out for the 3rd time in a week…………..
Don’t forget next week is the 5th major of the year, the strokeplay championship (plus best gross prize). Online booking is open and the evening presentation is at Los Balcones (El Pareton). Please try to pay your 7.50€ (for meal, drink and coach) by Wednesday nigh in the Clover. 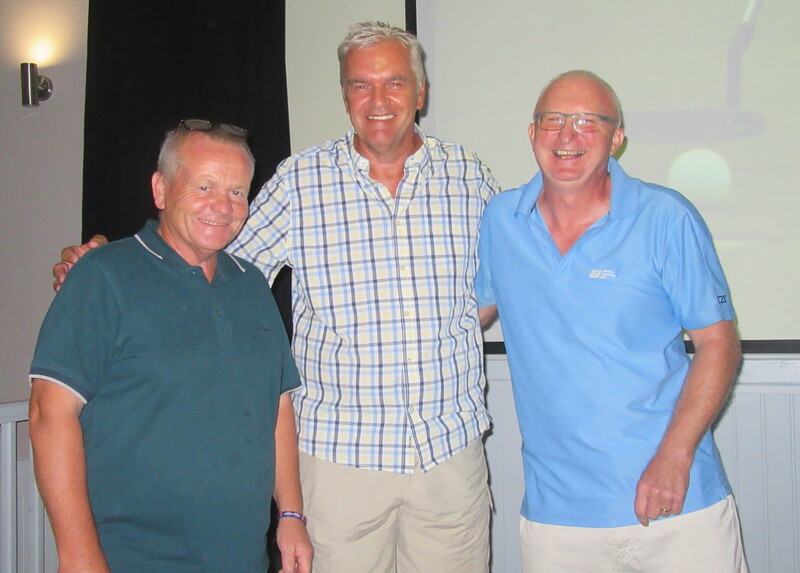 Good news re Peter Reeves – after 4 weeks in hospital he should be returning home today. Although he has a long way to go for a full recovery, he is on the right track, and all his friends at Condado wish him all the best and hope to see him soon.